A bronze monument to Badenoch and Strathspey’s Olympians was unveiled in 2007 by Sebastian Coe in Aviemore. The area has produced more Olympic athletes per head of population than anywhere else in the UK. Fifteen Olympic athletes have come from the area, which has a population of 13,500. Former athlete and Olympic organising committee chairman Lord Coe unveiled the sculpture – inscribed with the 14 names. There is also space for future Olympians to be added. The 14 are: Ian Finlayson (skiing); Peter Fuchs (skiing); Roddy Langmuir (skiing); Sean Langmuir (skiing); Ewan MacKenzie (Nordic skiing); Louise MacKenzie (Nordic skiing); Ingrid Grant (skiing); Alain Baxter (skiing); Andrew Freshwater (skiing); Douglas Dryburgh (curling); James Dryburgh (curling); Craig MacLean (cycling); Noel Baxter (skiing) and Lesley McKenna (snowboarding). Since then David Smith MBE has also added to the Olympian contingent with a Gold Medal in the mixed coxed fours at the London 2012 Paralympic Games at Eton Dorney. 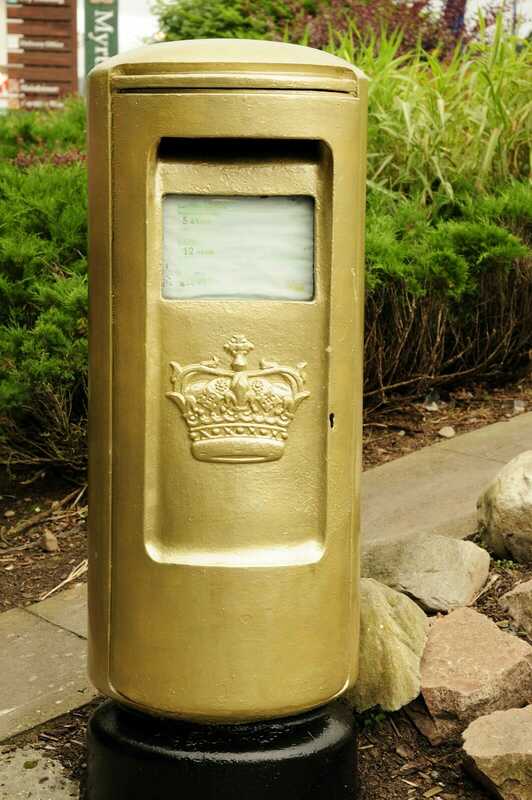 As tribute to all those in the 2012 Olympics who won a gold medal, the Royal Mail painted the Aviemore Post Office Post Box gold in recognition of his achievements. The box can be seen at Myrtlefield Shopping Centre outside the Aviemore Post Office. You can read all about local olympians from the Cairngorms National Park here.